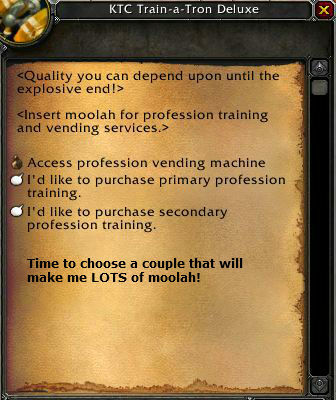 The trouble with most WoW crafting professions is that it’s tough to make decent coin from them, at low level anyway. Either there is too much competition or the items are too expensive to make. There are some sweet points, though. At high levels there are some in-demand items that can easily make your investment back. Of course, to make money with any of the professions you have to watch your costs. This means either selling high enough that you don’t care about the costs or buying/gathering at a low enough price that you can make a profit even with the competition. Many items just aren’t worth the effort, either because they’re way too expensive to make or they just don’t sell for much. The transmogrification system was a nice plus for crafters, as it gives people an excuse to buy your item. Now that you have a collection of appearances for any given piece of gear people might be interested in buying even if they never intend to actually use that item. They’ll just grab it to update the collection, like collecting another pet, and then dump it. Our Recommended Guide to making gold from your Profs. You’re weighing your time against materials being free. If you have no gold, but lots of time, head out and start gathering your ore/herbs/skins/whatever. If you don’t want to spend that time then you’ll buy your materials. One of the reasons people buy gold is to buy their mats. If you only have a couple of hours at a time to play then spending that time farming probably isn’t such an attractive idea. Buy a good gold guide and you’ll make enough, in a short enough amount of time, not to have to buy gold, ever again. That said, farming your mats is a great way to cut some costs and it’s a good way to kill some time while waiting for your dungeon/pvp/raid queue to pop or for your guild to get its act together and start that event. You will save a ton of time, but at the cost of some gold. For example, you can farm all the cloth to make bags and spend some time doing it, or you game save a ton of time and just buy it. Learn the price cycles for your mats. Keep a close eye on the Auction House and on the trade channel. At certain times the prices will be much higher than other times. Weekends, for example, have a ton of people playing and farming, the market is flooded, and prices drop. At other times a farmer, or group of farmers, may drop a ton of stuff at a rock-bottom price. Maybe several get into an undercutting war. If you’re patient and check the AH regularly over a week or two you can probably find some sweet deals. At other times a bunch of people just happen to buy up everything available and prices might be very high, if the item is available at all. If you see someone selling your mats cheap then trying sending her an email and offer to buy a lot more at her posted price. Make an offer in the trade channel. You might get laughed at, but maybe someone wants to dump a load of stuff in a hurry. Buying cheap is easier if you’re not pressed for time. Anticipate your needs and keep an eye on the AH or trade channel. Basically you’re looking to buy next week’s crafting mats, when the price is right. You can make a reasonable profit, meaning that it’s worth it to you to make & sell this thing? Don’t forget to factor in the time it takes to farm the mats. Can the item be sold at a higher price and still sell? Offer services in chat. Pretty much any crafting profession can do this. Most people work for tips (or to level their skills for free) as the “buyer” brings the mats. Some don’t tip (shrug) and a few tip well. Most crafting professions are expensive to level and the low level stuff generally doesn’t sell very well, or for very much, though there are some exceptions. If you plan on losing money until somewhere in the 200s, depending on the profession, then you won’t be disappointed. All of the profs have several items worth selling, especially at the highest levels. Once you know the market well you will be able to spot the points where someone posts their crafted items at too low a price. Buy them out and repost at the right price. The better you can control your costs the more flexible you can be with your pricing and the more likely you are to make a profit. As an example of the above: the Blacksmithing profession has several blue items, at or near level 60 (old raid items,) that require Dark Iron bars, various gems, and some other stuff. And to make the Dark Iron bars you will need to head into a dungeon to learn a specific skill and to use a specific anvil… Sheesh. Fine for back then, not so hot now. Several iLevel 359 items look pretty good, but require True Gold and other pricey mats. Even in Warlords the weapons and the armor pieces require items created by a daily crafting, misc elemental bits, and possibly some savage blood. Not that the armor and weapons don’t necessarily sell for much, but the items to improve them (add +15 item levels) do sell. The Auctionator addon can help you set up shopping lists that will make buying materials easier. You want to find slots without a lot of competition, or at least, competition that is not engaging in price wars. When you do find those slots don’t be afraid to ask unreasonable prices for your stuff. Start off at a price point that is triple that of your costs. Then adjust, depending on whether it seems to be selling or not. Keep increasing the price until it doesn’t sell anymore, then reduce a bit. Finds that happy point and try to stick to it. that item 8g 24g 22 sells well, mats are generally avaiable. You will want to set a maximum price that you’re willing to pay for your materials. It the item you’re crafting sells for a lot then obviously you can pay higher prices. If profit margins are low, but you can sell a lot of them (for example, Netherweave bags) then you can pay a bit more. The volume will make up for the low margin. It mats are always too high and the crafted item just doesn’t sell at the price you want then move on to the next item. A good example here are the common pieces you’ll make while leveling your craft. Some of the pieces will be made by everyone leveling their craft, so competition will be stronger than otherwise. Often these will be the items made at the lower levels of the craft. A number of people just don’t level their skills very far. You will, at times, find sweet spots. Items which are not produced by every person leveling their craft. These are the ones you want to keep an eye on. Post everything that you make on the AH. Keep at least an idea of the costs, even if you’re power leveling your prof. Note: Legion dropped a pack of demons onto the Inscription and destroyed the glyphs. All the remains are the items (staves, wands, etc.) and some glyphs that are purely cosmetic. Warlords introduced “mass milling.” You now have the ability to mill stack of 20 herbs with one shot. Nice. Apparently this is carrying over to Legion herbs. It does not apply to earlier herbs. The stuff below if retained her as an example, even though most glyphs are gone. I’ll use inscription as an example here, since that’s how I made most of my gold (here’s a pic.) Everyone in the game is a potential repeat customer for glyphs. They’ll buy the three Major and three Minor. plus another set for the dual talent build, and will very likely want to have some others to swap in and out for particular situations. That means every player is going to want a number of glyphs. Inscription isn’t quite the money maker it was when it was introduced with Wrath of the Lich King, but if you do it right it can pay off nicely. (TradeskillMaster is a BIG help here.) Keep an eye on your costs and sell a large variety of glyphs. If people post a few at very low prices it just means that you don’t have to make them. Buy and resell. If they constantly post at super low prices then drop that glyph and make a different one. Costs: If I’m buying herbs at 20g a stack it works out, for most glyphs, to cost me a bit under 15g to make each glyph. Basically, 20g of herbs makes 5 inks (on average) and you’ll need three inks to make each glyph. Paper costs are trivial. If you farm the herbs then there’s just the paper costs and the farming time involved. Do you have the free time to pick many stacks of herbs? If you buy the inks directly off the AH then you can skip the boring milling process and save a lot of time. Sometimes the prices are dirt cheap. This is what I do. Just keep your eyes open for bargains. There are also other inscriptions that sell well. The shoulder enchants, for example. The off-hand items and the higher level weapons and trinket all sell. Many an enchanter knows that disenchanting is a great way to make some extra coin. Disenchant your useless green/blue/purple items, sell the parts, make gold. One huge advantage of selling enchanting mats is that you do not have to undercut prices. Why? there’s very little deposit. So unless you really need a quick sale you can price them well above the lowest price and they’ll still sell, eventually, and there’s no cost to reposting them. Of course, if there are 500 stacks priced below yours you might have a long wait for that sale. Buying parts that are priced too low and reselling them is a tried and true method for profit. Buy cheap green items, disenchant them, make a profit by selling the parts. Everyone wants enchantments, especially the PvP and raiding crowds. A tried and true method of making gold is to offer your services in chat. Your services free (“buyer” brings the mats) and tips are appreciated. Just like in a restaurant, fast and friendly service gets more tips. Check prices for the enchant scrolls and if they look good then buy some vellums, enchant some scrolls, and post them on the AH. If you can get a deal on the mats you may be able to make some bucks with the scrolls. High end enchant scrolls can make you some nice money if you can get the materials cheap. With Warlords the top level enchants sell well and your garrison enchanter’s hut will be a big help. Note that if you have the hut you can sell a variety of enchants without actually having the skill. In general, potions, flasks, and elixirs are not very profitable. There are a few exceptions, but it might be more work than it’s worth. The potions, elixers, flasks, etc. are always in demand, especially by the Raiding and PvP crowds, it’s just that there is a lot of competition. Always keep an eye on AH prices and the cost of mats. Buy the mats when the farmers dump tons (and undercut each other) and sell your chemicals when the quantity available is low. Troll’s Blood potions are great for leveling and grinding. Raids always want various flasks and other chemicals. The high end products are also in demand. There’s pretty ruthless undercutting on potion prices, especially the low level ones. You can try the buy and resell techniques, limit your costs, and/or look for a sweet spot where you can make cash on a few pots. For those most part you’ll have to wait until your skill is pretty high level to make money with Alchemy. One area that is a definite possibility is with your transmutes. Usually the transmuted item sells for a lot more than what it costs you to make. Look into this on your server and give it a shot. The transmuted items are used in a number of crafts and prices are often worth the effort. In Warlords there are some nice trinkets that you can make. They might be worth exploring. Bags are great sellers. Every needs them for all of their alts (especially those Hexweave Bags made with your garrison Tailoring hut.) Clothes and some pretty nice armor pieces also sell. Vanity items, shirts (and other clothing items) are also decent money makes, even at low levels. Green items, from your power leveling, can be disenchanted and the component parts sold off. Enchanting goes well with Tailoring for this reason. Look into items such as Tuxedos, dresses, fancy shirts, and so on. You might be amazed at what they sell for. Some recipes are available only at certain events, such as the Festival Dress (Lunar Festival.) Get ahold of those and you’ll have less compatition. Some of the higher end stuff from prior expansions, such as the PvP gear, is cheap enough to make and can sell for nice prices. The high end Mists of Pandaria gear, on the other hand, can be very expensive to make. As mentioned above, always keep an eye on the market for bargains on the stuff you need to buy. Keep notes on costs and if the items sold are worth your effort. Blacksmiths look into making rods for enchanters. You might be surprised at how much they sell for on the AH. Also look into buckles, spikes, chains (weapon enchants,) and keys. Cataclysm PvP gear and some other gear sets can do nice things for your bank account. Pandaria PvP and gear sets are rather expensive to make and are slow sellers. Blacksmiths and leatherworkers can both make gear sets and items for transmogging. Most crafters can make gear that can be boosted and ilevel and can make the items to do the boosting. The latter generally sell for a pretty nice profit. Leatherworkers have a few bits, as well, especially with the Cataclysm recipes. As with the other crafts, PvP gear sells well and is relatively cheap to make, except for the M of P recipes. Jewelcrafters can prospect ores for gems (and sell them) and cut gems for profits and tips, as well as make a few nice items. Hard to find gems and raid only gems can be cut and sold for very nice profits. Some of the epic gems might take awhile to sell, though. Note that some consider Jewelcrafting to be a very profitable profession. Most people say that the best use of the crafting professions is to obtain certain items or self-only buffs, or just to have fun doing them. As gold makers, well, with a couple of exceptions they aren’t great for gold. This is why people recommend getting your stash first, then learning a profession. There are some secrets, though. You can make serious cash with these professions if you know what to do, when to buy mats, and what products are in demand. This Secret Gold addon will help you by doing all the research for you, allowing you to make serious cash with the professions, even Blacksmithing. Check it out, here.